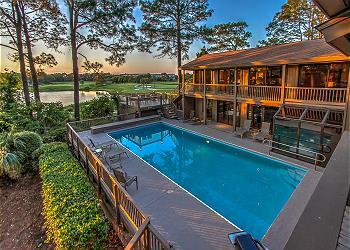 Quality craftsmanship and elegance without pretense greet you with this luxurious Palmetto Dunes home. 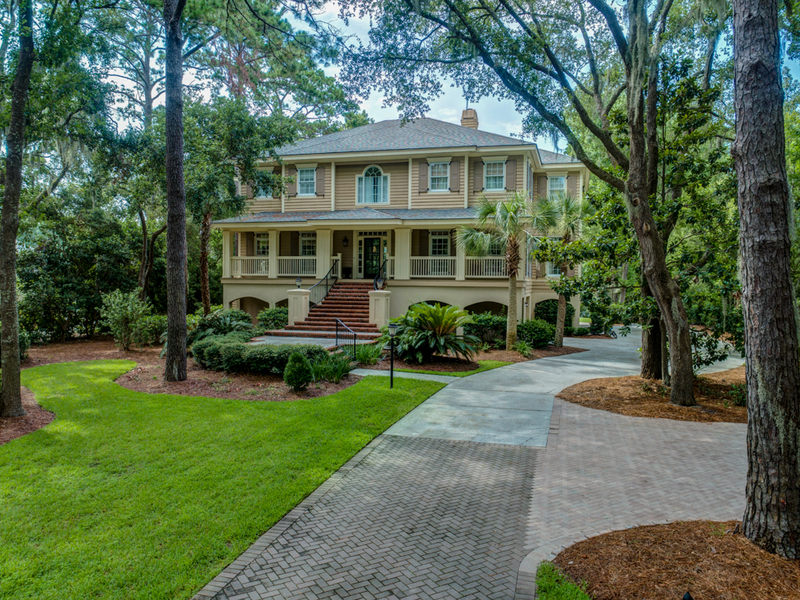 An island gem that’s the epitome of Lowcountry style gives off a warm southern welcome as you walk up the stairs to the inviting front porch. Inside you’re met with beautiful hardwood floors along with charming shiplap. 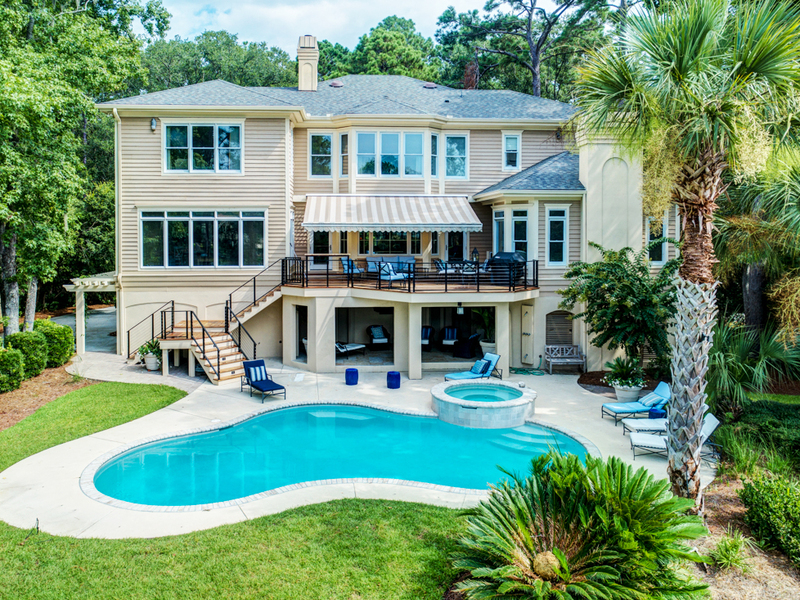 The main level has it all with a living room, music room, billiards room, Carolina room, kitchen, and a king suite. The living room has a gorgeous coffered ceiling and plenty of upscale yet beach-chic furnishings. The upgraded kitchen is a chef’s dream with its own dining area, enormous island, top-of-the-line appliances, and sand-colored granite counters. Outside is an island oasis that sits directly on a stunning 11-mile lagoon system. Fish off the private dock and reel in some fun! Or simply take in the incredible views while you unwind by the *heated pool and spa, and let the real world slip away with the tide. •	*Pools can be heated at an additional charge. This pool has a gas pool heater. The cost per week is $575-$1,000 (depending on the season) to heat pool. This house was beautiful and well stocked. It met our expectations and then some. There were a few minor issues that will work themselves out seeing that this was the first time they rented the house. Keyless entry was only on one door leading into the house after you were in the garage, so if an employee of the vacation rental company had NOT been there upon our arrival, we would NOT have been able to get in since there were no other points of entry. Also the passwords for wifi etc provided in the email from vacation rental company were NOT correct. The homeowners, however, had the correct ones posted throughout the home. As for the pool company and landscape companies, we wished that those time were a little more coordinated or at least we were given a heads up as to when they show up. The pool company showed up at an inconvenient time on Monday morning while we were enjoying family time in the water. However they were quick to come out after we called due to the fact that the landscapers cut the grass and blew ALL the grass clippings in pool on the following day. My son did ask me to mention that if they had provided some fishing rods he would have been super happy!!! One last remark, I rented bikes a few days before we arrived only to find out that the house provided 4 complimentary bikes. Not a big deal, we were able to get our money back but it should have been posted in the "about this property" section.